we believe that now is the right time to launch the first workshop on n-type PV as the majority of scientists start to realise that high efficient n-type Si solar cells will play a major role in the future of PV. Therefore we would like to invite you as a renowned expert in this field to give a presentation on the �nPV� workshop. Our first workshop on n-type PV will take place in Konstanz and will cover the entire value chain from silicon to solar cells. The two-day workshop (30./31. 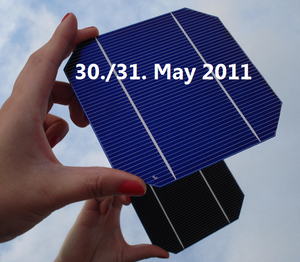 May 2011) is organised by leading institutes in this field - ECN, Fraunhofer ISE, ISFH and ISC Konstanz. The four to six presentations in each session (fundamental, crystallisation, emitter, passivation, metallisation and devices 1-3) will be chaired by experts in this field followed by a podium discussion with all the speakers in order to clarify the most critical issues in this field.